This dissertation is made up of five published articles that convey two underlying themes: 1) the nature of (non)specificity from many distinct points of view, both syntactic and semantic where specificity, i.e. D(iscourse)-Linking (Pesetsky 1987; Enç 1991), is elaborated in terms of a binding system that encompasses anaphora; 2) the role of predication within its relation to Focus Information, i.e. discourse structure. 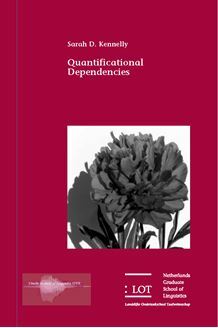 The analyses of both (non)specificity and predication are then integrated with discourse structure to provide the building blocks for the proposed analysis of Quantificational Dependencies (QDs). Stemming from the use of specificity to characterize members of a subset relation, where the superset is part of the previous discourse, Heim (1982) claims that specific DPs are necessarily familiar within the discourse. But in Everyone has a mother, where the DP ‘mother’ is clearly specific due to its self-defining D-Linking relation with the presuppositional, i.e. anaphoric (van der Sandt 1992) DP everyone, the discourse referents of the specific DP are not necessarily familiar. This example also counters the assumption that the multiple DP must be nonspecific (Ruys 1992; Farkas 1994; Farkas 2001) (plus many others). Empirically, any quantified DP can multiply. To replace the across-the-board association of (non)specificity with discourse structuring, the binding system developed here provides tangible definitions of discourse roles: locally bound DPs constitute New Information and non-locally bound DPs constitute Given. Under this analysis, the interpretation of a DP depends on its binding structure, and since binding structure cannot be determined until a proposition is complete, then it is not possible to interpret a proposition dynamically, as it unfolds. As the role of binding theory in determining the definition of a DP evolves, the need to explain quantificational interpretation in terms of covert movement collapses. A movement analysis is directly related to the representation of quantification in terms of first order logic. Under scrutiny the utility of such a representation cannot be sustained, thus paving the way for the analysis of quantification in terms of discourse, i.e. information structure, that is in terms of binding theory. QDs are analyzed as a mapping from Given to New Information.